Ask any trophy hunter and they'll tell you more tags are filled in the low-light hours than any other time. That said, it's wise to have a scope designed to excel in early-morning and late-evening light. Featuring Dusk & Dawn Brightness (DDB) multi-coated lenses for clarity and brightness in low light, you'll add precious minutes to every hunting day with the Banner® Dusk & Dawn® series. 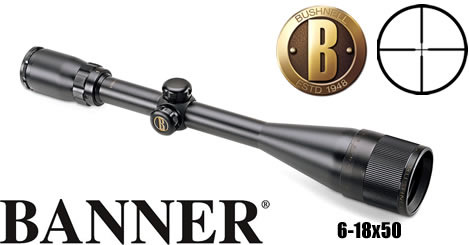 With one-piece tube design, the Banner Dusk & Dawn line includes a full assortment of specialty scopes for big-game, varmint, .22 rimfire, slug, black powder and turkey hunting. Multi-coated optics  One-piece tube  100% waterproof/fogproof construction  Dry-nitrogen filled  1/4 M.O.A. fingertip, resettable windage and elevation adjustment  Fast-focus eyepiece  Parallax Focus  Adjustable Objective Lens. Multi-coated optics  One-piece tube  100% waterproof/fogproof construction  Dry-nitrogen filled  1/4 M.O.A. fingertip, resettable windage and elevation adjustment  Fast-focus eyepiece  Parallax Focus  Adjustable Objective Len. Multi-coated optics  One-piece tube  100% waterproof/fogproof construction  Dry-nitrogen filled  1/4 M.O.A. fingertip, resettable windage and elevation adjustment  Fast-focus eyepiece  Adjustable Objective Lens.